Read my hit story for The Economist which was one of five stories flagged up on the front cover. You can read the original by clicking here.. 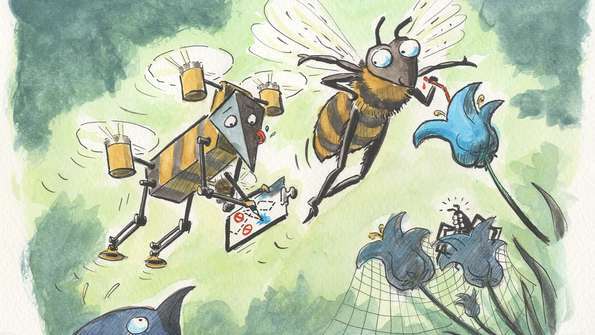 THIS year, some predict, will be the year of the microdrone. Small, pilotless aircraft—most of them helicopters with four or more sets of rotors and a payload slung between them—are moving out of the laboratory and into practical use. They are already employed for aerial photography and surveillance, particularly in Europe. In Paris, earlier this month, drones flying around the Eiffel tower caused a security scare. And in America, on March 19th, Amazon, a retailer, was given permission to test a drone designed to deliver its goods…. Ashutosh Natraj’s idea is to give his drones vision. Dr Natraj, who works at Oxford University, drew his inspiration from a bee he saw buzzing around his house one day. He wondered how the animal avoided the many hazards a human dwelling presents. The answer, he found after a few days perusing the apidological literature, is fairly straightforward, at least in principle. Bees rely on optic flow. This is the perception, familiar to anyone who has looked out of a train window, that nearby things are moving faster than distant ones. To build optic-flow perception into a drone, Dr Natraj had first to fit it with an eye and a brain. The eye is a video camera that weighs a mere 8g. This sends a stream of images, at a rate of 25 a second, to the brain. At the moment this is a computer on the ground that is linked to the camera by Wi-Fi. Dr Natraj, though, plans to replace it by a Raspberry Pi—a device the size of a credit card—on board the drone itself. The computer, whether terrestrial or airborne, extracts from the incoming images features salient to optic flow. In particular, it identifies objects’ edges and tracks them from frame to frame. This way, it can work out how quickly the drone is approaching something and, if a collision is likely, how the drone’s path needs to shift to avert it. It then uses this information to change the pitch of the rotors. Several groups of researchers are looking into insect inertial guidance. Those studying blowflies are based in London. Those studying moths are based in Baltimore. The London group, led by Holger Krapp of Imperial College, has used micro-electrodes to follow the insects’ nerve impulses, and high-speed photography and computed tomography (an advanced form of X-raying) to follow the movements of their external body parts and their muscles. That, with the addition of a bit of computer modelling, has shown them how dipteran inertial guidance works. Flies do it using input from hundreds—possibly thousands—of sensors. These are the elements of their compound eyes, and also the many cells at the bases of their halteres. The signals from these, it turns out, do not have to pass through the brain to be processed. Instead, they act as a series of reflexes controlling the insect’s speed, attitude and heading directly. That is the opposite of most approaches to engineering drone avionics. But it suggests that true drone manoeuvrability might be better created without trying to imitate the functions of a brain. Dr Krapp’s colleague Mirko Kovac is now attempting to do this. One way manoeuvrability might be engineered into a drone’s airframe is shown by the work on hawk moths. These insects, when hovering over flowers to drink nectar from them, employ a similar control system to flies—though in this case information from their antennae substitutes for that which flies get from their halteres. Hawk moths are being studied independently by two groups at Johns Hopkins University—one led by Rajat Mittal and the other by Noah Cowan. They have found that the moths hold their heads and thoraxes steady with respect to a flower by making minute changes to the orientation of their abdomens. Dr Cowan, indeed, has gone further than mere analysis. He has used knowledge garnered about how moths hover to fit a drone with the equivalent of an abdomen. The drone’s battery pack hangs beneath it, and is fitted with servo motors that adjust its position in the way that a moth moves its abdomen. That stabilises the drone in mid air. At Harvard, meanwhile, Robert Wood has taken a different approach to the problem of hovering. Though referred to as microdrones, quadcopters and their kin are usually tens of centimetres across. Dr Wood’s drones really are micro. They measure 3cm from wingtip to wingtip. Moreover, their wings flap like those of real insects, rather than rotating. Dr Wood’s artificial eyes are pyramid-shaped and have a photosensor on each face. They are thus able, like real ocelli, to track the sun. Dr Wood has not yet translated that ability into an on-board navigation system, but it should not be too hard to do so—so long, of course, as his drones do not come across any candles.